Valued as the highest quality of sea urchin. Every sack of sea urchin tastes sweet and melts in the mouth. Sushi ingredient with rich taste of ocean. Which wines pair well with sushi? 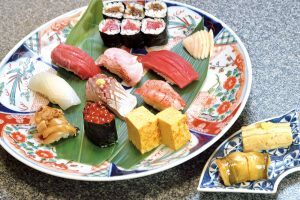 Fermented beverages such as sake and wine pair well with sushi. Sake is made from rice. So it only makes sense that this would pair well with sushi – also made with rice. It is also the only alcohol that eliminates the smell of fish and shellfish. On the other hand, when considering compatibility with wine, toppings that use strong seasonings like Nikiri, including tuna and conger eel with sweet filling, match superbly with matured red wines such as Pinot Noir. 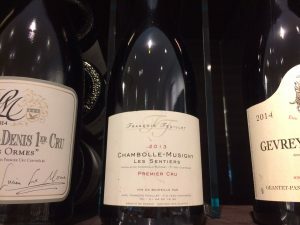 For example, Bourgogne Chambolle Musigny, Cote de Beaune, Morey-Saint-Denis, etc. White wines such as a lighter Chardonnay, Sauvignon Blanc and Riesling go well with white fish flavored with Citrus sudachi and yuzu or squid eaten with salt. However, neither red nor white wine goes well with herring or salmon roe. The iron specific to wine is said to contribute to the fishy smell of fish roe. In the research of one wine manufacturer, the factor that generates the smell of fish and shellfish is the iron (ferrous ion) found in wine. Wines with relatively low levels of iron such as Sherry (Spain), Champagne (France) fermented twice in the bottle, Cava (Spain) and Franciacorta (Italy) mature without adding sulfite, which prevents oxidization. This reduces the ferrous ion in the wine and the fishy smell is virtually unnoticeable. Either way, the research of wine and sushi pairings is still insufficient and there haven’t yet been any reports of unexpected compatibility. If anyone out there has found a wine that does pair well with herring or salmon roe, please be sure to share that information with us. See Best Wine For Sushi? 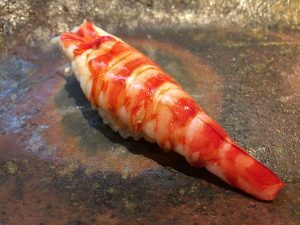 Posted on July 10, 2017 January 17, 2019 Categories EdomaesushiTags Anago, Ginza, Ikura, Nigiri sushi, Sea urchin, Sushi etiquette, Wine16 Comments on Which wines pair well with sushi? Why is it that sea urchin can taste bitter? 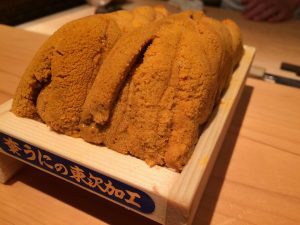 Some people say that “Sea urchin in a wooden box (called ‘hako-uni’ or ‘ori-uni’ or ‘boxed sea urchin’) has a bitter medicine taste”. When a sea urchin loses its freshness, its starts to disintegrate so an additive called alum is used to maintain its shape. If you’ve ever tried a sea urchin that tasted bitter*, this may be the reason. 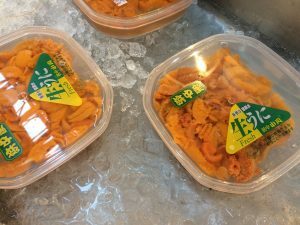 Sea urchin soaked in brine without using alum (called ‘ensui-uni’ or ‘saltwater sea urchin’) is also commonly found. There is also a new technology that doesn’t use alum. In this method nitrogen water (water from which oxygen has been removed and then nitrogen dissolved) is used when sealing. The effect of replacing oxygen with nitrogen is inhibited oxidation, maintaining freshness of the sea urchin. *An “off flavor” that takes away from the primary good tastes. 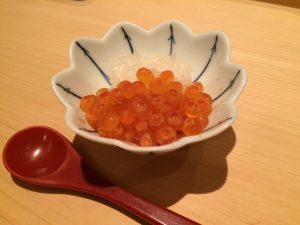 Posted on April 18, 2017 March 11, 2019 Categories TriviaTags Nigiri sushi, Saltwater sea urchin, Sea urchin, Sushi Ingredients6 Comments on Why is it that sea urchin can taste bitter?